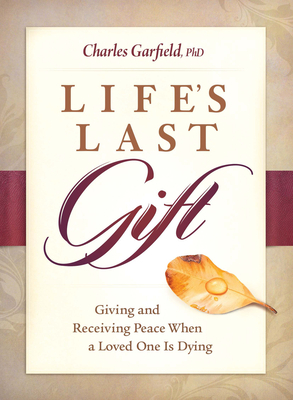 After four decades of training volunteers to sit at the bedsides of the dying, psychologist and Shanti founder Charles Garfield has created an essential guide for friends and families who want to offer comfort and ease their loved ones' final days. Life's Last Gift is an indispensible emotional lifeline to hand to the grief-stricken, offering compassionate, practical advice on reaffirming connection and acquiring skills to be of the greatest service to those at the end of life. By focusing on the reciprocal and healing relationship between the living and the dying, which continues until the last breath, Garfield offers a path toward clarity and wholeness, and even growth. More than 90 percent of Americans believe it is a family's responsibility to provide care for a loved one who is dying, and more than 650,000 people in the United States each year die at home, where much of the caregiving is done by family members and friends. Approximately 43.5 million caregivers have provided unpaid care to an adult or child in the last twelve months (National Alliance for Caregiving and AARP, 2015). Charles Garfield, PhD, founded Shanti, an internationally honored volunteer organization dedicated to the care of the dying and those living with cancer and AIDS, and the Shanti National Training Institute, which takes Shanti's model to organizations around the world. A Fellow of the American Psychological Association, he is currently a research scholar at the Starr King School of the Graduate Theological Union in Berkeley. Charles Garfield, PhD, founded Shanti, an internationally honored volunteer organization dedicated to the care of the dying and those living with cancer and AIDS, and the Shanti National Training Institute, which takes Shanti's model to organizations around the country and world. He has been teaching the skills of serving dying people for more than forty years and was named National Activist of the Year for his work with Shanti. Garfield has worked as a clinical professor of psychology in the Department of Psychiatry at the University of California School of Medicine at San Francisco (UCSF) for more than three decades. While on the faculty of the Cancer Research Institute at UCSF, he was one of the early contributors to the burgeoning field of psychosocial oncology. A Fellow of the American Psychological Association, he is currently a research scholar at the Starr King School of the Graduate Theological Union in Berkeley. He also teaches courses on the end of life at the Metta Institute in San Francisco, where he is a founding faculty member of the training program for end-of-life counselors, and at the C.G. Jung Institute of San Francisco. Garfield writes for and serves on the editorial board of Greater Good, a national e-magazine from the University of California, Berkeley's Center for Science and the Greater Good.